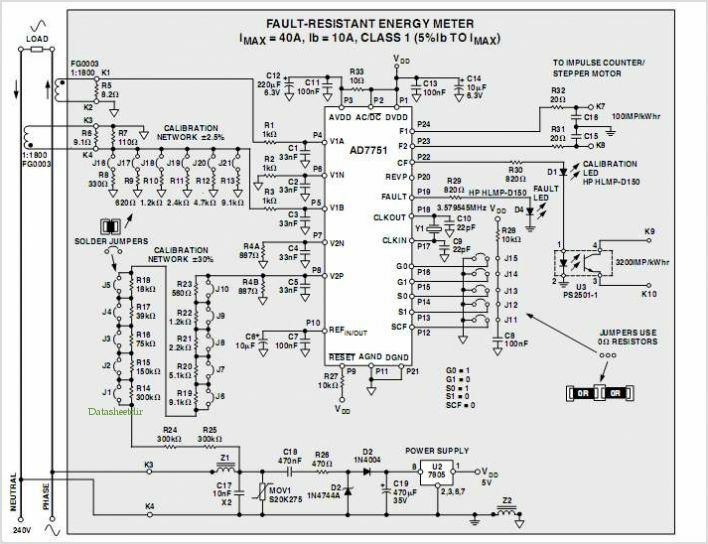 This application note describes a low-cost, high-accuracy watt-hour meter based on the AD7751. The meter described is intended for use in single-phase, two-wire distribution systems. However, the design CAN easily be adapted to suit specific regional requirements, e.g., in the United States power is usually distributed to residential customers as single-phase, three-wire. The AD7751 is a low-cost, single-chip solution for electrical Energy Measurement The most distinctive feature of the AD7751 is that it continuously monitors the phase and neutral (return) currents. A FAULT condition occurs if the two currents differ by more than 12.5%. Power calculation will be based on the larger of the two currents. The meter calculates power correctly even if one of the two wires does not carry any current. AD7751 provides an effective way to combat any attempt to return the current through earth, a very simple yet effective way of meter tampering. The AD7751 is comprised of two ADCs, reference circuit, and all the signal processing necessary for the calculation of real (active) power. The AD7751 also includes direct drive capability for electrome chanical Counters (i.e., the energy register) and has a high-frequency pulse output for calibration and communications purposes. This application note should be used in conjunction with the AD7751 data sheet. The data sheet provides detailed information on the functionality of the AD7751 and will be referenced several times in this application note. АКСОЛОТЛЬ , личинка хвостатых земноводных - амбистом; способна к размножению (см. Неотения). В естественных условиях иногда не превращается во взрослую форму. Объект экспериментальных работ.